The first storm of the season – Storm Ali’s is hitting the UK, with winds of up to 80mph expected to disrupt travel and cause flying debris. The Met Office has issued an amber weather warning in Northern Ireland, Scotland and the north of England. There could also be power cuts. 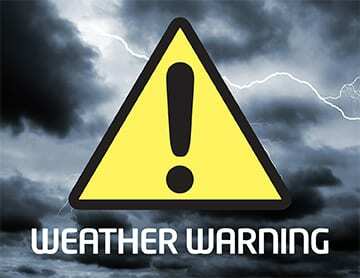 An amber weather warning is in force from 08:00 BST in Northern Ireland, Scotland and the north of England. Debris flying in the wind could endanger life, journeys are likely to be disrupted and there could be power cuts, the Met Office said. Milder yellow wind warnings were issued across Wales for Wednesday. Storm Ali is the UK’s first named storm of the season, with storm Helene which hit Wales on Tuesday having taken its name from a US hurricane. A very windy day with gales in the north as Storm Ali hits across the UK. Heavy rain is expected, followed by blustery showers in the north. It could rain heavily at times in southern Britain too but also expect some breaks of sunshine during the day. London will see highs of 22 during the day and 16 during the evening and night. Manchester will see a high of 18 during the day and low of 10 during the night. Edinburgh will see a high temp of 16 during the day and 9 at night. As the evening arrives Strong winds and gales will continue persisting across much of Scotland and Northern Ireland with further blustery showers and some of which will be heavy. Winds easing in the south but heavy rain will spread east to many areas. Moving into Thursday we will see widespread heavy and persistent rain which looks set to change to sunshine and showers on Friday, before becoming more settled on Saturday.